Sunday! Catchup! We’ll start with this reminder: The Anniversary Sale continues! Through Monday, you can get Michiko and Beth’s first three adventures for just 99 cents US each! They’re also 99 cents CA/AU/NZ, 0.99 £, and 0,99 €! Grab them now, and happy reading! More after the cut. The Anniversary Sale is on! 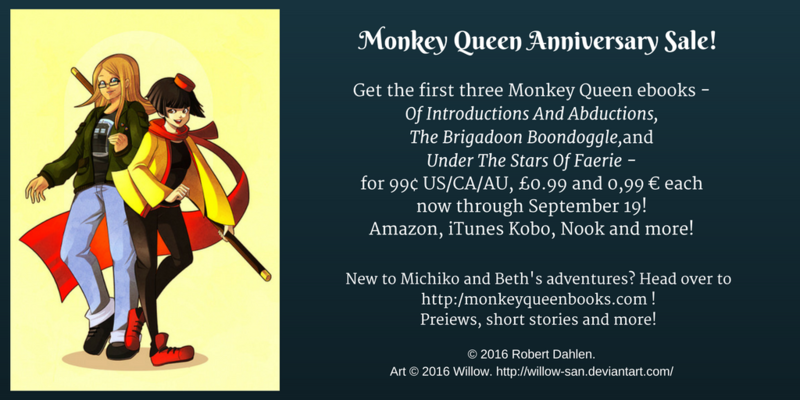 This coming Monday, September 19, marks the second anniversary of the official debut of the first Monkey Queen book. To celebrate that, you can get Michiko and Beth’s first three adventures for just 99 cents US each! Start with the first book, Of Introductions And Abductions, where Michiko and Beth first team up to rescue a kidnapped friend. In the second book, The Brigadoon Boondoggle, they have to stop a conflict between Emigres while unraveling a real estate scheme gone bad. And in the third, Under The Stars Of Faerie, they face a deadly assassin and a mad gremlin and team up with airship pirates! If you’ve never read the Monkey Queen books before, this is the perfect time to start! If you’ve read the first, catch up now on books two and three! And ebooks make great gifts! Click here to buy from Amazon, or search your favorite ebook retailer for “Monkey Queen”! This sale ends Monday, so don’t miss out! Thanks for your support, and I hope you enjoy the books! Tagged as anniversary sale, sale! Willow Wednesdays: maybe it’s a Beauxbatons uniform?